If you have read my Coffee Cherry Muffins recipe, chances are you know by now why I love coffee so much. I love the aroma of strong, bold coffee and being Portuguese, I am definitely an espresso kind of girl. I usually only have two coffees per day though, a bigger one in the morning and an espresso after lunch. But they do have to count so I normally go for straight strong types, no milk and no sugar. My husband is quite the opposite, although Austrian, he doesn’t touch coffee, says he doesn’t like the aroma or the taste. I tried to convert him many times but have failed till now. Such a waste if you ask me. You can imagine then my hesitation with this recipe, I wanted to surprise him with a nice breakfast but at the same time had visions of the horror in his face when I would mention the word coffee! So I decided to avoid the word and just present him with the pancakes and hope for the best. I do believe that when you want somebody to try something you know they would reject upfront just by hearing the ingredients, you should forget mentioning them and wait for the reaction. Many years ago, when I was a child, my mother had a seamstress that came to our house to fit clothes and make new dresses. She always told my mother she hated cheese and when my mother asked her if she had ever tasted it, she answered no, never, she just knew she didn’t like it. We knew better than to say to my mother that we didn’t like something without ever tasting it. So one day my mother decided to trick the seamstress. She cooked steaks and made a very nice sauce with cheese in it and then invited her to join us, as she always did. During the whole meal, the seamstress kept repeating how wonderful the dish was, that my mother was a great cook and that she had never tasted something so delicious before. Then at the end my mother said how wonderful it was to find out that she liked cheese after all. You should have seen her face! She thought she was going to die! Even said she was feeling sick! My mother told her to stop being silly! It turned out her mother had told her cheese was terrible when she was a child and she had never dared to try it. We all, seamstress included, ended up by having a good laugh when she realized she wasn’t dying after all and that cheese was actually nice. In the meantime, I totally agree with him. This was such a pleasant surprise. The pancakes were so fluffy and the coffee really enhanced their taste. Such a perfect way of starting the day! 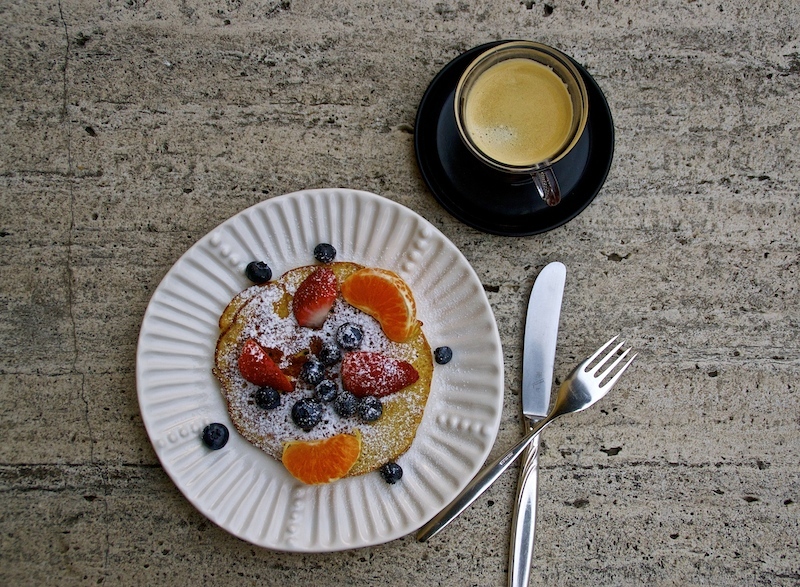 The fruits complemented the coffee pancakes beautifully. Valentine’s Day is around the corner and I do think this recipe would also be an original way to surprise your significant other, after all more than expensive gifts, these small gestures really show how much you care. And if they are coffee lovers even better! 1 espresso coffee, about 1/3 cup. I used an intense, strong coffee but you can choose to your taste. In a bowl pour the coffee, milk, vanilla extract (if using), add the sugar, the egg yolks and beat until smooth and creamy. Sift in the flour with the baking powder and beat well. Whisk the egg whites into firm peaks, add them to the batter and fold in. 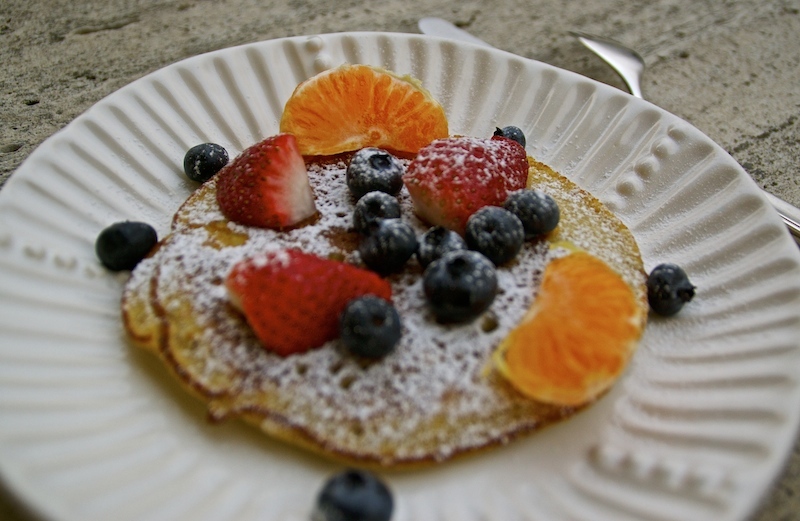 Line a nonstick pancake or small pan with cooking spray and heat at medium-low. Add one soup ladle of the batter to the pan and cook until bubbles start appearing on the surface. Then turn the pancake and cook on the other side for 2 minutes more. Repeat the process until you use all the dough. 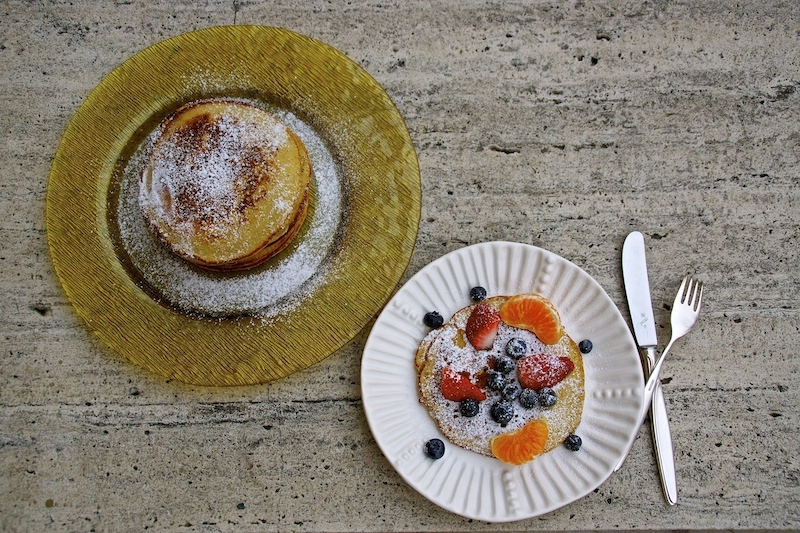 Top each pancake with the fruits and sprinkle with icing sugar to taste. Don’t forget to accompany it with your favourite coffee! Enjoy!